Edimburgh court ordered Greenpeace to stop its direct action against the Chevron’s prospect for deepwater drilling. Greenpeace swimmers against a Chevron-chartered ship and expert climbers spent four days hanging off the ship. Project Details The deep-water Lagavulin prospect is 160 miles north of the islands. Well 217/15-1z, on the Lagavulin prospect was spudded in October 2010 and drilled in 1,567 metres water depth. Total depth was reached on 10 June 2011. Hydrocarbons and a working petroleum system have been confirmed, however no workable reservoir system was found to be present at this location and the well will be plugged and abandoned. The well was drilled with the Stena Carron drillship. Faroe Petroleum, the independent oil and gas company focusing principally on exploration, appraisal and production opportunities in the Atlantic margin, the North Sea and Norway, announced ( 13-06-2011) that drilling has reached target depth on the Lagavulin exploration well (Faroe 10%), operated by Chevron, in the UK Atlantic Margin to the west of the Shetland Islands. Why? Explain briefly. 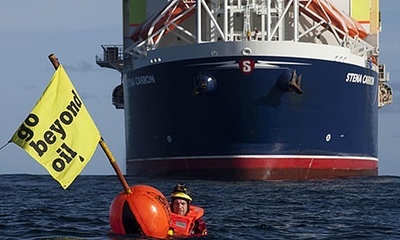 Greenpeace's protest was useless to prevent the project, but they gave media visibility to this situation and following the Chevron's huge vessel on her way to the Lagavulin prospect, their protest delayed the start of the exploration for several days. 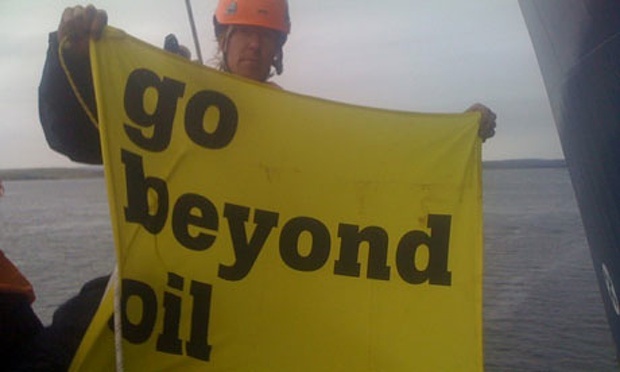 Severin Carrell, Greenpeace claims activists could occupy Shetland oil-drilling ship for up to a month, The Guardian, September 22, 2010. Severin Carrell, Chevron wins court order in bid to end Greenpeace oil protest, The Guardian, 24 September 2010. Greenpeace UK, Attaching our survival pod to the Stena Carron, September 22, 2010. "We've stepped up our action against the Chevron-operated drilling ship Stena Carron in the waters off Shetland where - in addition to climbers Victor and Anais on the anchor chain – a custom-built survival pod has been brought into play. Two metres in diameter and weighing half a tonne, it's also been attached to the anchor chain. The drilling ship was due to leave shortly to drill exploratory deep water wells in the Lagavulin oil field - but now isn't going anywhere. We're here to stop dangerous deep water drilling in UK waters, which resulted in the Gulf oil disaster earlier in the year. Greenpeace campaigner Leila is on hand to tell you more..."
Go Beyond Oil Greenpeace environmental campaigners swim out in front of an oil drilling ship, chartered by Chevron, in an effort to stop it sailing to a deepwater drilling site off Scotland. Photograph: Will Rose/Greenpeace/PA.